Sharon Wood Wortman and Ed Wortman, authors of The Portland Bridge Book, and Edith Fuller, a retired PPS district librarian, are part of a volunteer effort to create The Big & Awesome Bridges of Portland & Vancouver—A Book for Young Readers. This will be the first ever bona fide book for children about the local bridges. A project of PDX Bridge Festival, Inc., the goal is to give 4,000 free copies to Portland Public Schools and to Vancouver School District for classroom use. For more information, go to bigandawesomebridges.org. Bridges have been taught as part of PPS third grade social studies curriculum since at least the 1950s, but there has never been a book about the bridges for elementary students and their teachers. The Wortman's are also leading the fundraising campaign to get the book printed. 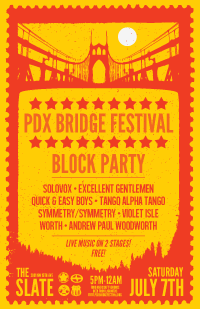 To donate (all donations are tax-deductible) and/or to learn more about the project and how to get your name listed in Big & Awesome, visit www.pdxbridgefestival.org and check out the Indiegogo campaign. Help fund the new limited edition book they are publishing on a volunteer basis with PDX Bridge Festival, Inc., a 501(c)(3) nonprofit charitable organization, to give to Metro-area school classrooms and libraries: The Big & Awesome Bridges of Portland & Vancouver-A Book for Young Readers & Their Teachers. Meets at Floyd's Coffee, 118 NW Couch in Old Town, 2 p.m., Sunday, October 27. Visit the ODOT Bridge Museum, meet a bridge operator, and walk into the bascule pit of the Morrison Bridge-one of the largest mechanical structures in Oregon, to see gears 36 feet tall in operation. About 3 hours, with tea and a snack afterwards in Chinatown. $125 per person or $200 a couple, includes food, plus an autographed copy of the new book, being printed in a limited edition just in time for the 2013 holidays. Get your copy while you can! Anytime someone buys a book, they are helping to pay for two or more free books that will go to school kids and teachers. Pre-registration not necessary, just show up. Questions? 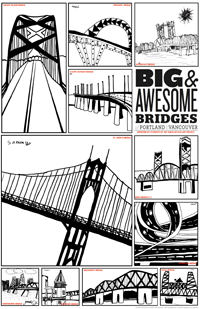 Visit bigandawesomebridges.org or call 503 330 0900. July 7, 2012 - Celebrate the Steel Bridge’s 100th birthday this year with a FREE party at the Slate, 2001 NW 19th, in the Northwest Industrial District of Portland. Scion, one of the festival's main sponsors, is providing the space: Lots of music, lots of food vendors, and lots of bridge stories. Sign up for one or all six “pay as you will” bridge walks celebrating the Steel Bridge’s 100th birthday. All proceeds go to fund Big & Awesome. Saturday, August 11, 9 a.m. until noon, join Sharon Wood Wortman and Ed Wortman for a walk across the Steel Bridge and other downtown Portland bridges. Includes a visit to the Morrison Bridge to meet the operator and tour the bascule pit. Begins at Floyd’s Coffee, 118 NW Couch, Portland. No advance reservations necessary. Friday, July 13, and Saturday, July 14, join Sharon for one-hour walks to the Steel Bridge as part of the Union Pacific Railroad’s two-day 150th birthday celebration at Portland Union Train Station. The Steel Bridge pay-as-you-will walks begin at 11 a.m. and 2 p.m., both days, and begin and end at the train station. No advance reservations necessary.